Buick Regal: What Makes an Airbag Inflate? 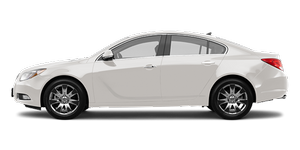 Buick Regal / Buick Regal Owners Manual / Seats and Restraints / Airbag System / What Makes an Airbag Inflate? In a deployment event, the sensing system sends an electrical signal triggering a release of gas from the inflator. Gas from the inflator fills the airbag causing the bag to break out of the cover and deploy. The inflator, the airbag, and related hardware are all part of the airbag module. Frontal airbag modules are located inside the steering wheel and instrument panel. For vehicles with seat-mounted side impact airbags, there are airbag modules in the side of the front seatbacks closest to the door. For vehicles with roof-rail airbags, there are airbag modules in the ceiling of the vehicle, near the side windows that have occupant seating positions.